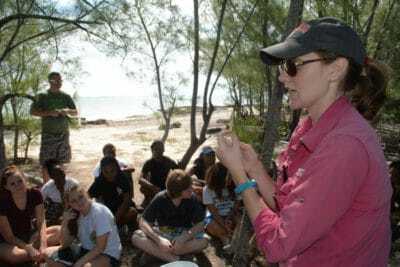 North Carolina State University (NCSU) student Ryann Rossi is studying mangrove disease throughout the Bahamas. Through a partnership with NCSU, our students in the B.A.M. and J.A.M.I.N. programs are participating in her hands-on citizen science project by helping to find cases of mangrove disease in their 5 x 5 meter squared plots. 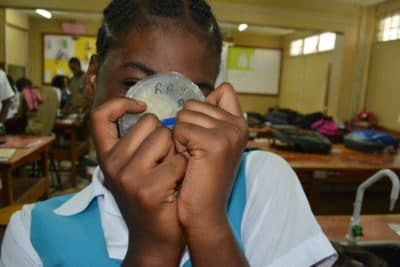 In 2017, Ryann Rossi joined us to implement the disease activity in the Bahamas. Here she is explaining what the diseased leaves look like. 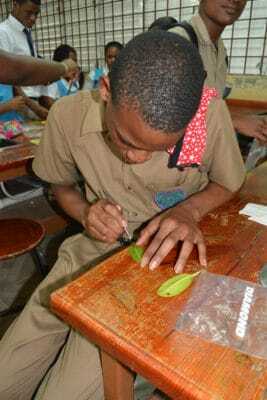 During the project, each student collects a red mangrove leaf that has necrotic (dead) tissue on it. Students look for patches of brown that have penetrated through the under and upper sides of the leaf. Once they have found the leaf, they record the GPS location. Students collect the leaf by severing the petiole, a structure that connects the leaf to the stem of the tree. 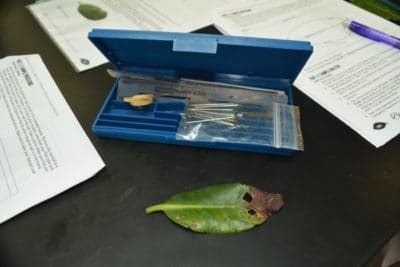 The student labels a bag with their name and the date the leaf was sampled, and places the leaf in it for further analysis. The investigation begins again in the lab with students drawing their leaf and labeling its structures and areas of dead tissue. Students cut two samples of necrotic tissue from their leaf, including both live tissue (green) and dead tissue (brown). They sterilize their leaf samples by placing them in a bleach solution for a couple of minutes. Then, they sterilize the tweezers in a flame before picking up their leaf samples from the solution. Carefully, the students insert their leaf samples in the agar of their petri dish. To prevent contaminates from getting into their petri dishes, the students wrap their petri dishes in cling wrap. 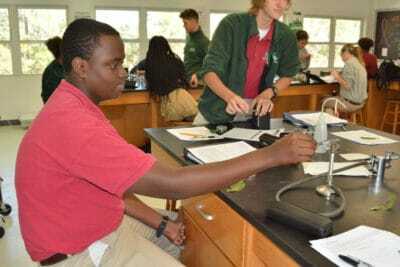 Student at Forest Heights Academy sterilizes a pair of tweezers. 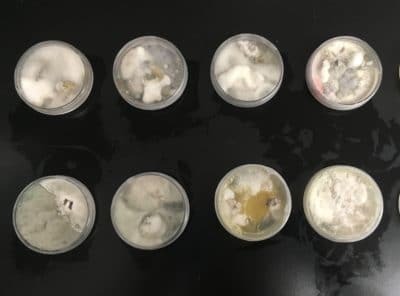 It doesn’t take long for the fungi to begin growing in the petri dishes. Students document the presence of fungi and/or bacteria after 3 days and one week of growth. 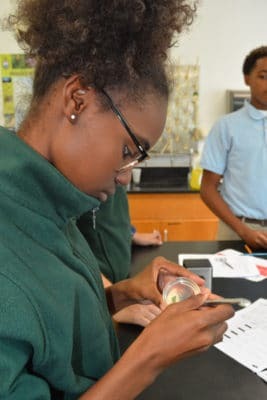 After two weeks, students identify the fungi that have grown on their plates. If they find the disease culprit, Pestalotiopsis, then they remove part of the fungus and agar and place it on a special paper. They pound the sample into the paper and remove the bigger lumps. 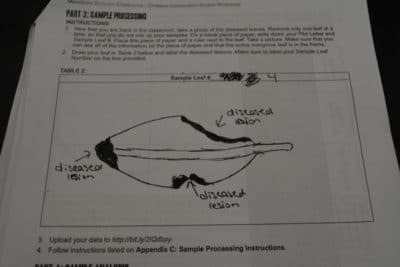 The samples are then sent to Ryann Rossi, who will further examine the samples to confirm the students’ identification. If present, Ryann will include these samples in a larger database. This petri dishes (left and middle photo) contain the newly plated mangrove leaves. The photo to the right was taken a couple of weeks after the initial plating and contains bacterial and fungal growth. By partnering with NCSU, students in the B.A.M. and J.A.M.I.N. 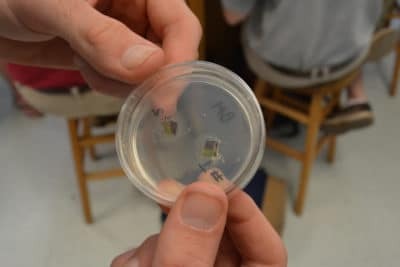 programs are not only learning advanced scientific techniques, they are contributing to actual science. Through partnerships such as these, we are able to offer more opportunities to our program participants. Students in the J.A.M.I.N. and B.A.M. programs prepare their mangrove leaves to insert in agar plates. In our next blog, learn how this disease-causing fungi spreads from mangrove to mangrove.